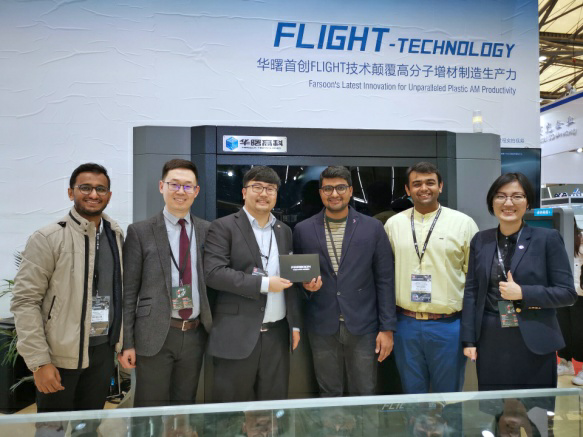 Sahas Softech, a Mumbai-based 3D printing service bureau and design studio, has announced a strategic partnership with two Chinese 3D printer manufacturers Farsoon Technologies and UnionTech. Sahas Softech with UnionTech at TCT Asia 2019. Image via SAHAS Softech. Sahas Softech specializes in industrial design and prototyping and has concluded projects related to engineering, architectural and consumer goods. Furthermore, the company has also worked with the Indian holding company Reliance Industries and TATA Consulting Engineers, a subsidiary of the multinational conglomerate TATA Group. The automotive branch of the group, TATA Motors, is considered the primary driving force behind the growth of the Indian 3D printing industry. With the new partnership, SAHA Softech will add UnionTech’s industrial SLA 3D printers and Farsoon’s polymer SLS machines to its portfolio. “The future of SLS and SLA 3D Printing technology looks very promising and is the next step to on-demand manufacturing,” said, Sohrab Kothari, co-founder of Sahas Softech.